Moses had gone up to the mountain with Joshua for quite some time. When the Israelites saw that Moses is not coming back, they began to feel impatient. They put heavy pressure on Aaron and Aaron couldn’t take it anymore. So Aaron said, “Give me all your gold earrings.” So the Israelites took off the gold earrings from their sons and daughters and gave them to Aaron. Aaron built an altar and announced feast to celebrate the calf idol the next day. The people rose early the next morning and presented offerings to the calf idol. After that, they ate and drank.The Israelites made noisy partying and were merry. When Moses was coming down from the mountain, he saw the calf idol that Aaron made and the people were dancing and making merry. Moses’ anger burned against the Israelites. 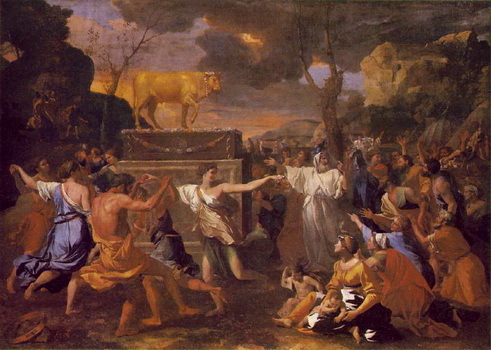 Moses took the calf idol and grinds it into powder and poured them into the water. Then he made the Israelites drink it. Moses saw the people are still running around like a wild man. Moses stood at the camp entrance and said, “Whoever that is for God, come and stand here.” The Levites gathered beside Moses. The Levites did as Moses commanded them and 3000 men and women died that day. The Lord was very angry with the people and he struck them with a plague.